Hi everyone! This week I started following an official training plan again, and it feels so great. I haven't been following a plan since my last half marathon in October, and I'm really excited! I think having a bit of a break from racing and strict running was the perfect cure for my burnout and I'm ready to go. I'm going to be talking about my racing schedule (and training plan) later this week, but I decided to run the Gettysburg Marathon this year. This will be a redemption race since I dropped out of it last year, and I'm excited to be training for another full marathon (my first since I started blogging!). Easy run to start off training! I don't know if it was the weather or the excitement about starting a new training plan, but I was flying on this run! I felt great and could not get myself to slow down. Great start! In my training plan, I do a core workout every Monday. It's 12 simple moves that get really tough as you go through them. You can find the workout here! My first speed workout was a fartlek. The structure was running a mile to warm-up, then three sets of 2 miles fast, 1 minute slow, 1 minute fast, 2 minutes slow, mile cool down. One thing that I like about fartleks (or speed play) is the freedom to switch it up as you go! I didn't worry about hitting paces or running exactly 2 minutes. Since I run across bridges, I tried to make most of my "hard" minutes going across the bridge so I got some uphill and downhill sections of fast running. Definitely a tough workout! Dan and Selma wanted to go for a run, so we went around the neighborhood. We walked a bit, but mostly jogged for the three miles. Fun run! I woke up not feeling so great, so I ended up sleeping in and missing a group run. The extra sleep was great for me, because the second time I woke up I felt 100 times better! It was also great timing, because my new shoes were delivered right before I left and I tried them out on my run. This was a great run where I felt better and better each mile. 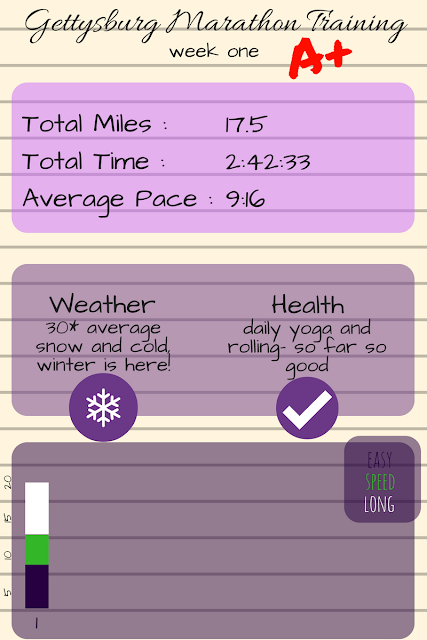 It was my coldest run so far (24 degrees when I started), so it took me around 4 miles to actually feel warmed up. I checked my pace for the first mile, which was 9:24, and just zoned out after that. When I checked my paces after I finished, I was happy to see that each mile got faster, ending with an 8:58 final mile. Is anyone else planning on running a full marathon next year? Yay for week 1 of training! Looking forward to reading your recaps. And I love the graphic you have at the beginning showing an overview of your week. Good luck this training cycle! Nice job on week one! Woohoo! So exciting. I'm glad you and Dan and Selma can run together. Family time FTW! I didn't realize Gettysburg had a marathon. Why did you choose that one? is it a pretty flat course? It's near where Dan grew up, so we can stay with his family. I also like the fact that it's a smaller race. It looks pretty flat with rolling hills in the course profile so we'll see! Way to go on week one, girl! Yay! I'm so excited to hear that you are training for another marathon! Can't wait to hear about your training plan and racing goals. I haven't been running much lately, but I have been practicing yoga semi-regularly. I just came across that same 30 days of Yoga and was planning on starting it soon. It's really good! I think you would like it if you give it a try! So exciting that you are running Gettysburg this year! Well done on week 1 and I am excited to read more about your training plan. I love family run times with Ryan and Ollie or Charlie (or both) - we get exercise in but I don't feel like running is taking away from our time together on the weekends. Thank you Laura! Spending quality time and working out is the best. Ann! I didn't know you're doing Gettysburg! Excited for you!! !